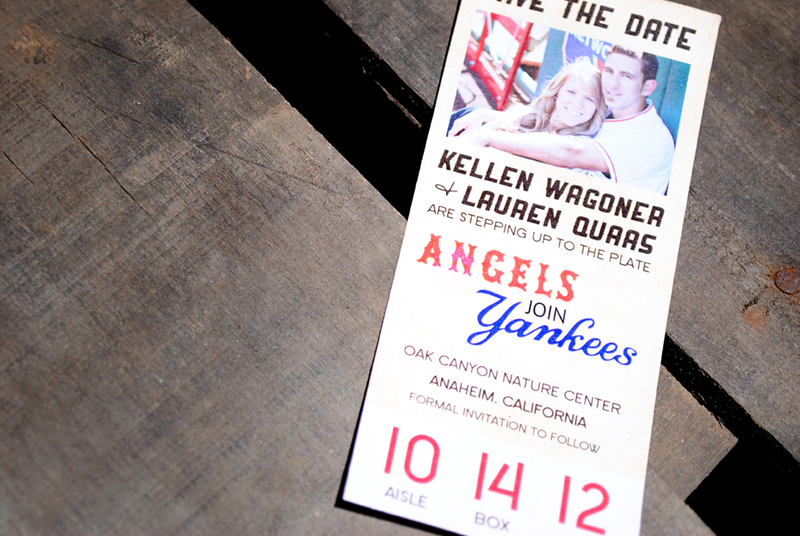 When our friends Lauren and Kellen booked their engagement session, with Lindsay Chavez, at Angels’ Stadium, the first thought I had was to make their Save the Date look like a baseball game ticket! Their actual wedding is themed with outdoor rustic and camping items, which is totally them, but baseball is another fun activity that they love to attend and follow. 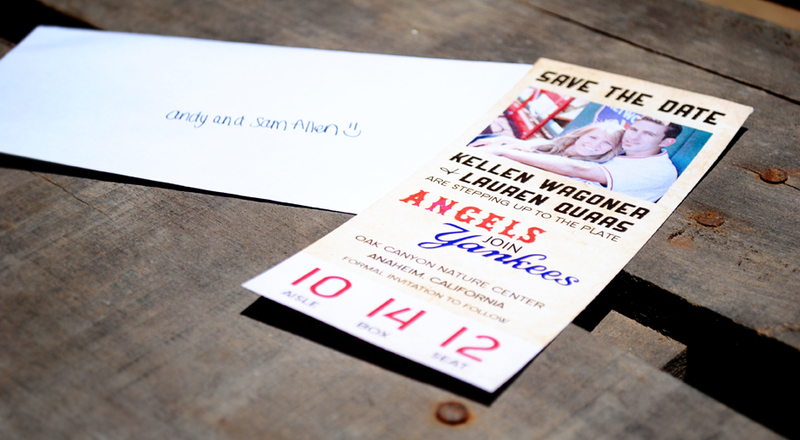 So in keeping with the rusticness of their wedding we created a vintage baseball ticket for their save the date. Adding another fun twist is that Lauren is a huge Yankee fan while Kellen just loves the Angels, so what better teams to come together for a game of baseball! And I just love the way the final product came out! While researching baseball tickets and their various looks, I came across this Angels’ ticket from 1962! From then on, I knew we were on the right track! And the rest of the design flowed from there. So excited for your wedding in October! Love you both!! yahoo!!!!! i love our dave the dates, your the bomb girl. I cant wait to see our invites! Can I ask how did you make these?? Hi Kristen.. I designed them in Photoshop and had them printed at Staples. I LOVE Them!! Is there a template in Adobe Photoshop that helps out or did you design it from scratch…I may have to go buy Photoshop!! The bride has saw a similar layout online so that’s close to the same but the look and feel and of course the layout was all created in Photoshop.